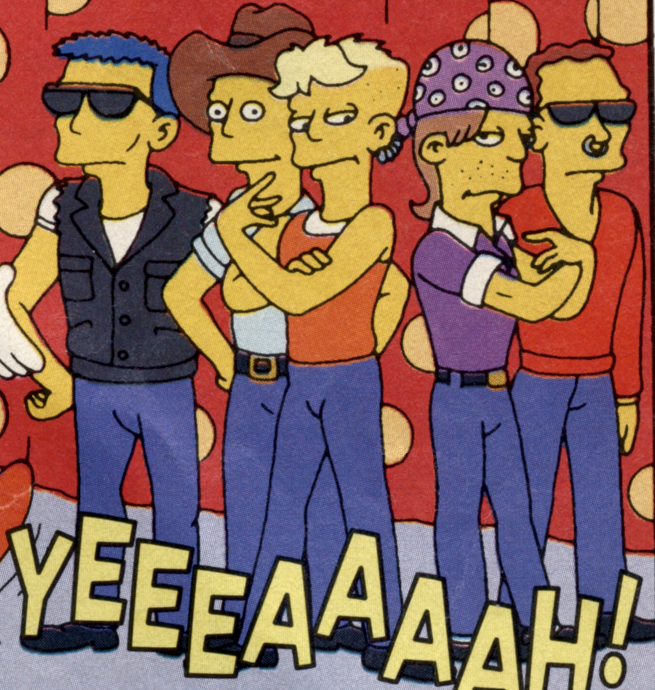 Boyz from da 'Burbs is a boyband consisting of five members. They released a number one hit single titled "I Want It That Way with my Vida Loca Genie in a Bottle One More Time". They performed this song live on The Krusty the Clown Show to the delight of all the girls and Milhouse in the audience. Krusty interviewed them after their performance, but he quickly went into a rant about the hardships of being an entertainer, to the confusion of the band who expected him to ask about their tour. Lisa watched the performance on television and Bart mocked her for her love of boy bands which he dismissed as "fake". Their name is probably a reference to both the boyband The Backstreet Boys and the film Boyz n the Hood. Modified on September 23, 2018, at 07:53.